This week the Link Gallery is hosting a display of kites, flown (or not), and videos taken at the annual MMU Art School kite flying trip to Glossop. The trip is organised by Michael Howard, MMU Art History Lecturer – and celebrates the joy of flight, but also marks Ludwig Wittgenstein’s trips out to test meteorological kites. Wittgenstein stayed at the Grouse Inn at Chunal. The kites are in varying states – some battered and broken, some intact. The exhibition as a whole looks a bit like the trip – windblown, chaotic, part success, part disaster, and fun! More images, information about Wittgenstein’s kites, and a video of the outing can be found on Roger Bygott’s Interactive Arts Blog. The video is also on Clive Parkinson’s Arts For Health Blog along with a good write up. We worked on this exhibition in close collaboration with Richard, his wife Shelley, Chris Larkin from the Stroke Association, and Clive Parkinson from Arts For Health. It was part of a Stroke awareness month and also the first major event for the newly re-branded Stroke Association. We are extremely privileged to be able to curate this exclusive show. Richard Creme ran the incredibly successful L’Homme fashion boutique in Manchester until he had a stroke in 2007, which meant that he could not carry on with the business. As part of his recovery he started to create artwork in his sketchbooks and later onto canvas. 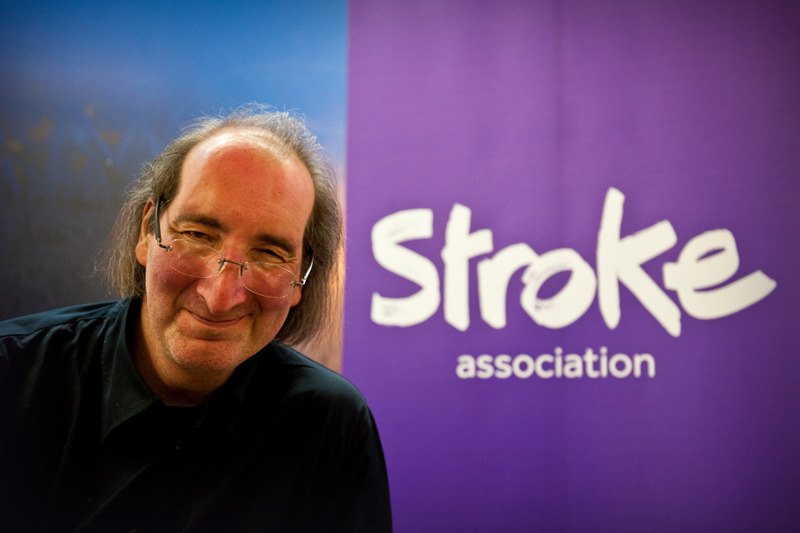 The experimentation and artistic progress helped him through a difficult period learning to live with the effects of the stroke, which most noticeably have affected his speech. Arts For Health and the Stroke Association asked us if we would like to curate and host the exhibition in the Link Gallery. We went through Richard’s entire collection of work and were given the freedom to pick the pieces we thought would tell his story best. The exhibition starts with the Porkinson series. They are positioned asymmetrically to indicate a continuation of one scene not realised until we took them out of the sketchbooks. The piece features a private joke between good friend and noted fashion photographer, Norman Parkinson. The emphatic upward pointing finger is a motif repeated in all three pieces to guide the eye up through the scene. The headless bodies are unusual pieces made in the early part of Richard’s recovery. The intensity of the biro markings in particular, with distinct missing head, reveal a frustration brought out onto the paper. We decided to frame the opposite ink-imprinted page as another dimension to the piece, and to show it within the context it was made. The perforated edges of the paper continue throughout the exhibition to leave the raw creative space of the sketchbooks intact. The sketchbooks were a lifeline in his recovery, so we felt it was important not to hide it behind more traditional mounting techniques. The central hexagon of the gallery holds a section of portraiture. On one side there are Richard’s self-portraits which reveal different emotional states, as well as documenting his experimentation with diverse artistic styles. Directly facing these, in a form of conversation, are portraits of his wife, Shelley, a significant figure in his life and throughout his recovery. Central to the whole exhibition is the unusual double-sided self-portrait, which is mounted in a specially designed frame. We decided to suspend it high up to give the viewer a sense of the man himself – a large man with an impacting personality. Finally, the end hexagon holds the ‘list’ series – bright copies of important lists and receipts pertaining to his former life as owner of an iconic fashion shop. Deeper meanings and stories run through these pieces, which elevates them past mere representation. 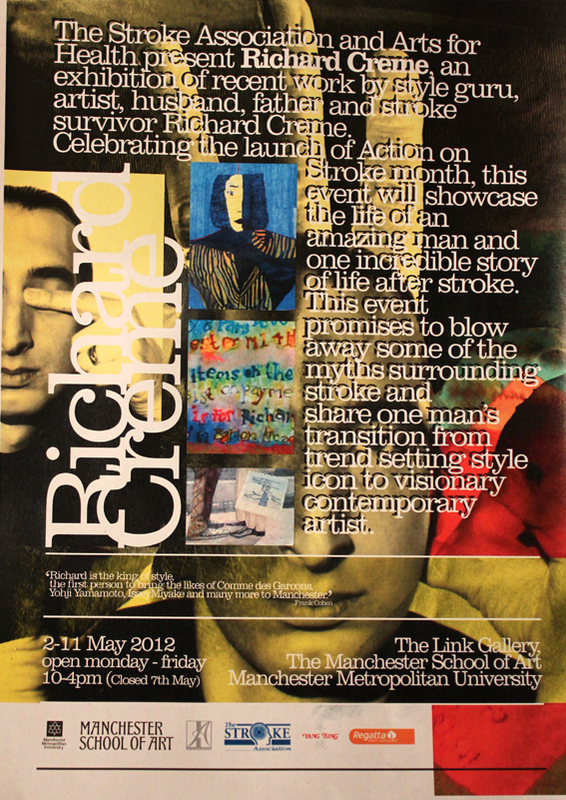 The local press has picked up on the Richard Creme exhibition. 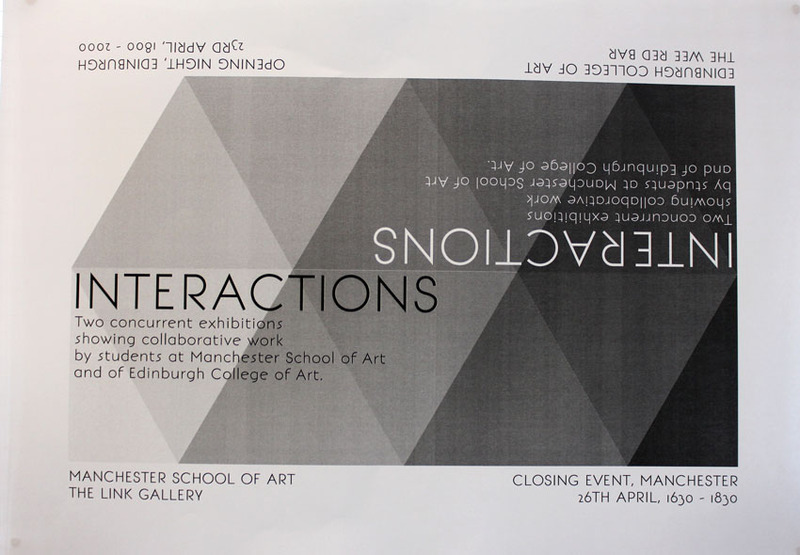 ‘Interactions’ has been an ongoing collaborative project between students on the Interactive Arts course at Manchester School of Art and students on the Intermedia Course at Edinburgh College of Art. This is the third exhibition of self-selected group MMU Foundation Course work. The first Future Foundations show was in 2010 – co-initiated by and including work by Elisa Artesero, current curator/organiser of the Link Gallery. Then last year Future Foundations 2 included work by Roger Bygott also current Link Gallery co-organiser/curator. So this show has a healthy lineage and good momentum. As with the previous Future Foundations shows there is a great sense of variety, exploration and experimentation across several media. “Light Weather is my first solo exhibition in the Link Gallery. The exhibition comprises of two parts: the Link is a large scale installation, at one end of the gallery there is an abstract sky lit up with coloured flashes of light, throughout the rest of the gallery there are coloured pools of light suspended above the floor. The Foyer space shows some of my abstract light photography and an experimental light sculpture.